Starting with a handful of dedicated quilters in 1991 meeting at Cut Ups, a local quilt shop, Ties, Needles and Threads Guild has outgrown 3 meeting places in the last 26 years. Over 50 members are currently meeting monthly at the Glen Carbon Community/Senior Center, with many of the original members still active in the guild, enjoying local and national speakers, workshops and social actives. 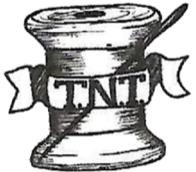 The original TNT logo was a whimsical representation of exploding dynamite. The current hand drawn spool logo was adopted and lapel pins were made with it in early 2000’s. 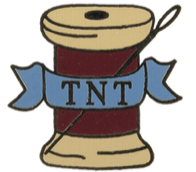 The logo from the pins was modified a bit and used for the updated website in June 2017.